Quick, healthy meals by a loving team. See what’s cooking in J & K's kitchen! 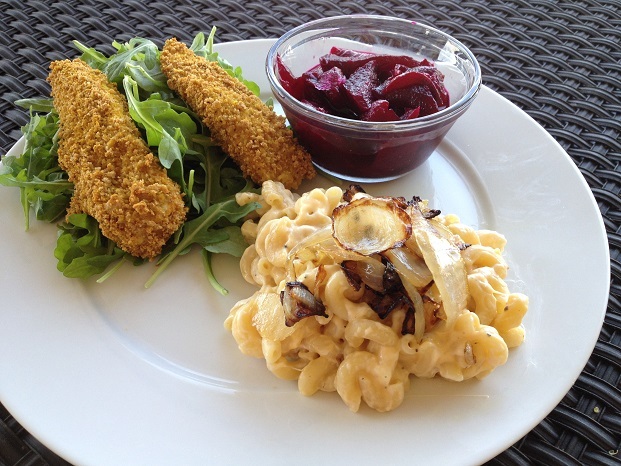 …You get wild dishes like crunchy chicken tenders with 3 types of spices; and mac and cheese made with surprise ingredients like Greek yogurt and topped with fancy things like caramelized onions, and you get fresh beets with the most brilliant red beet juice that even Red 40 can’t compete with. Now that’s fun and delicious. Preheat oven to 350°F. Remove stem from beet. Rinse beet and wrap in a large piece of aluminum foil, adding about 2 tsp of water. Bake in oven for about 1 1/2 hours or until soft when pierced with a fork. Remove from heat. Allow to cool. Peel skin and discard. Chop into bite-sized pieces. Place in a small bowl and top with vinegar. Stir to combine. Serve in small bowls. Nutrition note: Beets are an excellent source of folate which has been associated with happiness. Preheat oven to 350°F. Grease a baking sheet with no-stick cooking oil. Slice chicken breasts into strips. In a small bowl, combine, curry powder, cumin, and turmeric. Stir in panko bread crumbs. 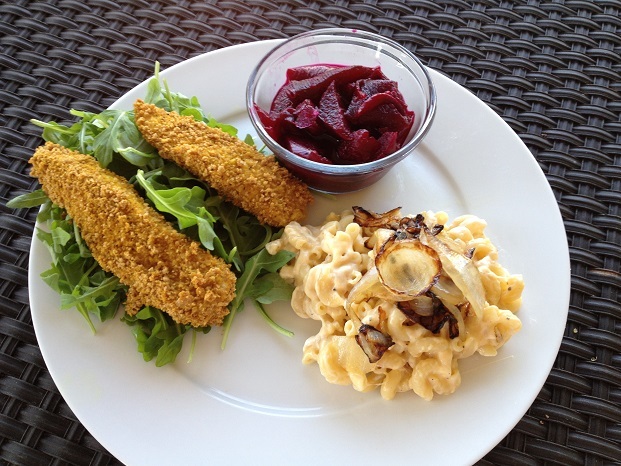 Roll chicken strips in bread crumbs and place on baking sheet. Bake for 12 minutes or until cooked throughout. Allow to slightly cool. Serve on top of arugula. Nutrition note: The benefits of these tasty tenders (compared to many of their restaurant counterparts) are whole grains, antioxidant-containing spices, and no added saturated or trans fats. Slice onion. Cut slices in quarters. Add olive oil to a medium pan followed by cut onion. Cook for about 15 minutes, stirring occasionally or until onions caramelize and are golden brown. Set aside. Meanwhile, in a medium pot, cook macaroni according to directions on package (bring water to a boil, cook for 10 minutes, drain water). Stir in shredded cheese, margarine, Greek yogurt, salt, and pepper. Top with sauteed onions. Nutrition note: Using fat free Greek yogurt and margarine helps add creaminess and good for you fats, while cutting back on some of the saturated fat and calories. 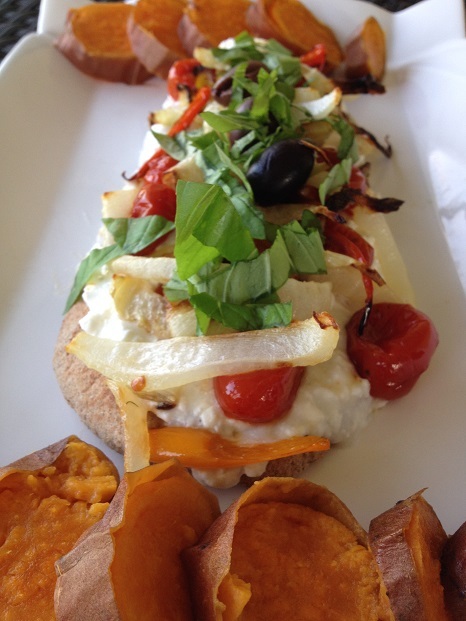 Jamie says: I think I’ve missed cooking and blogging! Now that I’ve completed the 40 Two Sisters, Dine Out blog posts for Spain and have returned from my travels, I’m looking forward to spending a little more time playing in the kitchen. Following my Hawaiian Salad lunch, I made Indian Roasted Veggie Pizza with Sweet Potato Slices for dinner. The colors of the dish were vibrant and the taste exquisite. The whole grain Indian naan bread made a nice base. I piled on the cottage cheese. 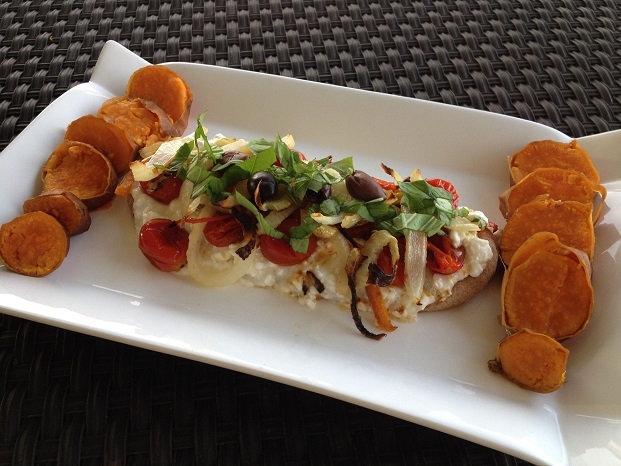 I liked how the cottage cheese was creamy and rich and secured the roasted veggies in. Fresh basil always makes a nice finishing touch, too. 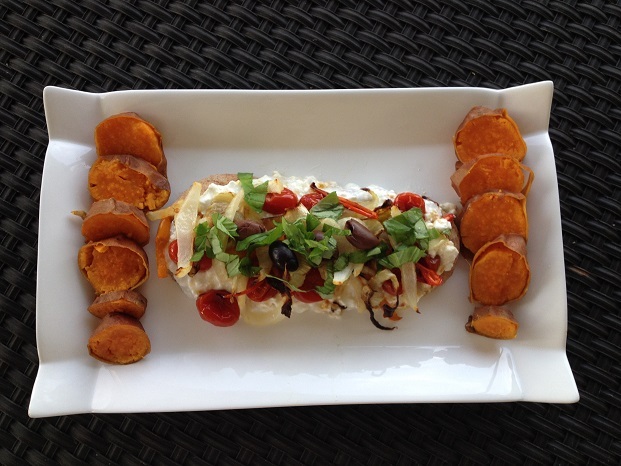 The sweet potato was super easy to make (I’m talking tin foil and a potato here) and made a fun side dish. And who would think that cottage cheese could replace traditional cheese on a pizza? It can! Give it a try. Preheat oven to 350ºF. Rinse sweet potato. Place sweet potato, still wet, on a piece of aluminum foil. Wrap potato in foil, pinching ends together to make a pocket. Bake in oven for about 45 minutes or until soft. Slice potato into coin-shaped pieces. Slice fennel and onion. Place in a small pile on a baking sheet. Drizzle with 2 tsp extra virgin olive oil. Mix the oil into the veggies. Space evenly on baking dish. Roast for about 35 minutes or until slightly golden brown. Place cherry tomatoes together in a baking dish and drizzle with 1 tsp extra virgin olive oil. Gently toss to coat. Space evenly. Roast for about 25 minutes or until soft. Place naan on a baking sheet. Top with cottage cheese and roasted fennel, onions, and tomato. Heat in oven for about 6 minutes or until cottage cheese is soft. Use kitchen sheers to cut basil over naan pizza. Top with kalamata olives. 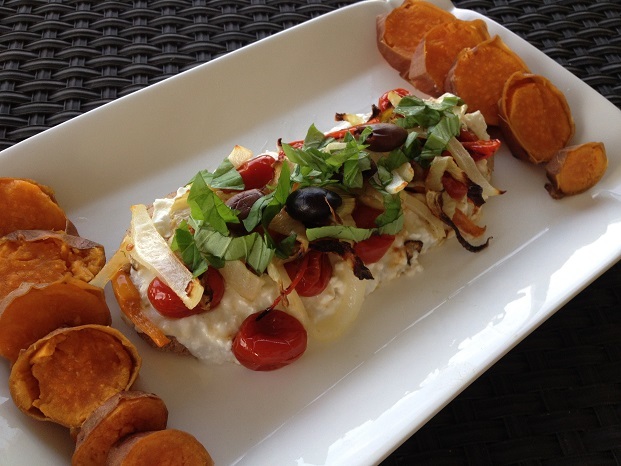 Serve with sliced sweet potato on the side. Enjoy! *Cooking note: You can quadruple the veggies and the oil and use the leftovers on salads. Nutrition note: Veggies amp up the flavor and the nutrients. Looking for “superhero vision in the dark?” (Not quite but it sounds good to kids.) Eat your sweet potatoes. They are loaded with beta-caratone which helps with night vision. Looking for a powerful antioxidant? The lycopene in tomatoes can fight those free radicals in your body. Now, that’s pretty cool. Jamie says: Lately, I’ve been into trying new things, including previously unexplored foods such as Barefruit fruit chips (which add a great crunch), South Beach Good to Go Gluten Free Dark Chocolate Raspberry bars (they taste like jelly rings but with a lot of fiber and protein), mochi ice cream (not to be confused with the fro yo shop), Publix Premium salad kits (a speedy way to make a unique salad), the True juices from Grimmway Farms (they taste like bottled smoothies), and dried pineapple (unsweetened but sweet as can be). With the dried pineapple, I made a Hawaiian Salad which looks quite fancy but only took a few minutes to make. 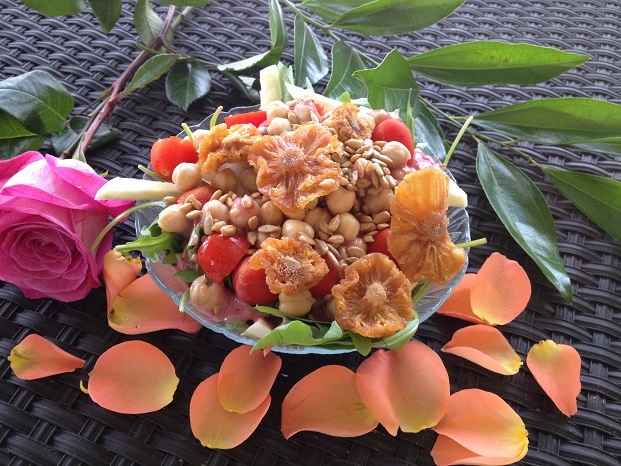 The dried pineapple and the cranberry ginger dressing amped up the flavor profile. And how beautiful are those pineapple rings? Place arugula in a salad bowl. Chop fennel, rinse and drain chickpeas, and slice tomatoes in half. Add to salad bowl. Sprinkle with sunflower seeds. Drizzle dressing on top. Add pineapple pieces. Enjoy! 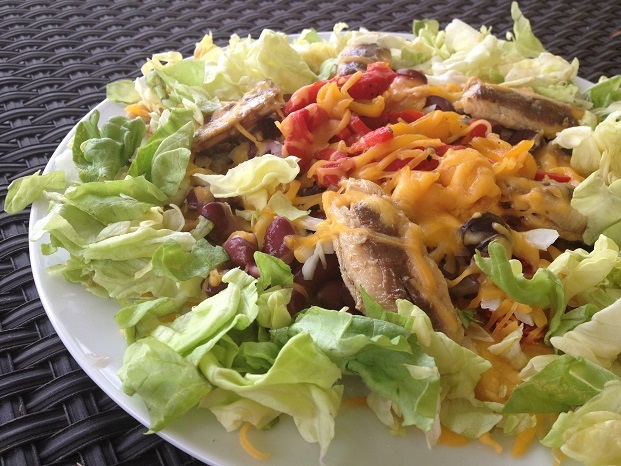 Nutrition note: Try substituting croutons with unsweetened dried fruit for a nice crunch. 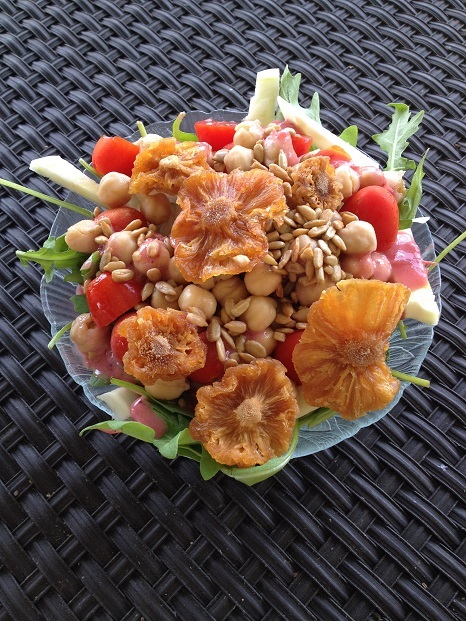 The dried pineapple is an excellent source of fiber which will fill you up more than the croutons. Jamie says: This ones for the nacho lovers. A nutrient-packed nacho dish that outshines (in nutrition and taste) your typical restaurant nachos. For the sardine lover, this combo totally works! For those who are less adventurous, give it a try. You might like it. Start out with the skinless and boneless sardines and try the traditional ones with the bones and skins later on for an extra nutrient boost. 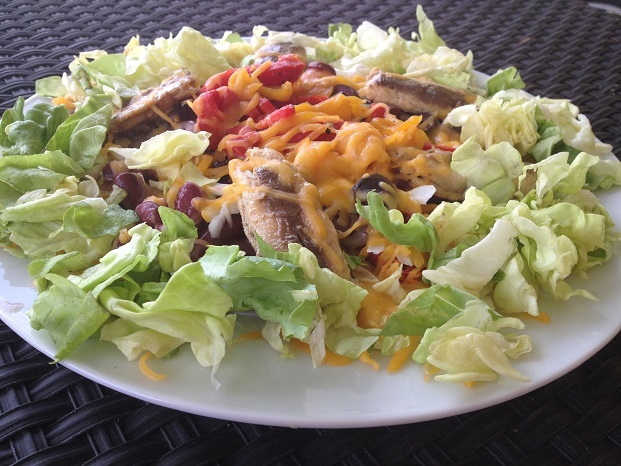 Sardines, not your typical nacho topping…but it totally works! Spread crackers on a microwave-safe plate. Rinse and drain beans. Dry with a paper towel and place in a small bowl. Stir chili powder into beans. Chop onion. Chop roasted bell pepper. Pat dry with a paper towel. Slice olives. Top crackers with seasoned beans, chopped onion, bell peppers, sun-dried tomatoes, sliced olives followed by shredded cheese and whole sardines. Microwave on high for 1 minute. 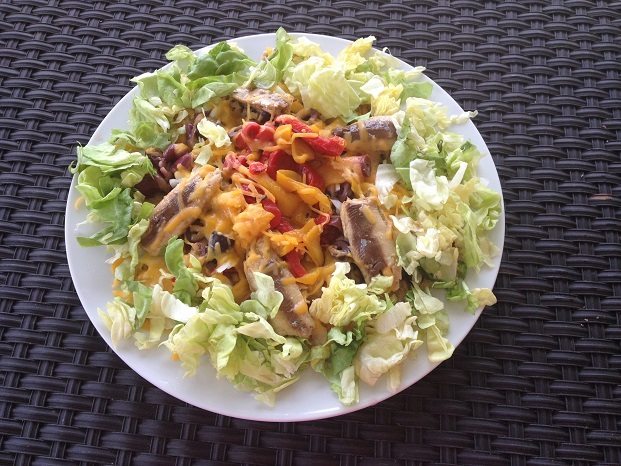 Check nachos, microwave an additional 30 seconds if needed or until cheese is melted and sardines are hot. Pour lettuce on the boarder of the plate. Enjoy! Nutrition note: Sardines are an excellent source of those hard-to-get omega-3s. Want extra calcium in your diet? Choose the ones with the bones! Jamie says: Last weekend I raced my 16th triathlon, Top Gun Sprint Triathlon in Fort Desoto. I love everything from packet pick-up to body marking (this was the first time I had tattoo numbers!) to buying my race day song on iTunes (Yeah by Joe Nichols was my song of choice) to waking up at 4:30 in the morning to being surrounded by athletes. I was blessed to be recognized on the podium with another Registered Dietitian Nutritionist. Can you believe that? Two RDNs made the top 5 in our age group. The power of nutrition! Want to know what I ate the day before? 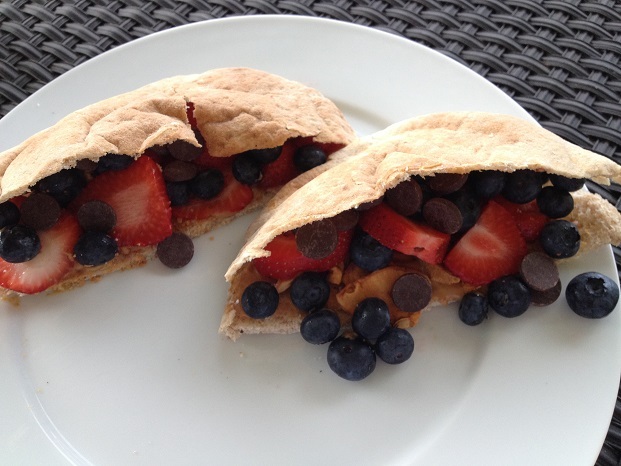 My pre-race day lunch was Crunchy PB & Fruit Fondue Pita Pockets. I loved the crunch, the combo of chocolate and peanut butter, and the juiciness of the fruit. And I absolutely love a glass of cold milk. It balances out the thickness of the peanut butter (and adds protein and 9 essential vitamins and minerals). I made these a second time, too, but this next time I microwaved the pockets, which made the chocolate melt and the fruit more preserve-like. Both options were tasty, but I think melted is the way to go! Cut pita in half and gently peel open. Place on a microwave-safe plate. If peanut butter is refrigerated and hard to spread, scoop into a microwave-safe bowl and microwave for 10 seconds. Stir. Repeat at 5 second intervals until softened. 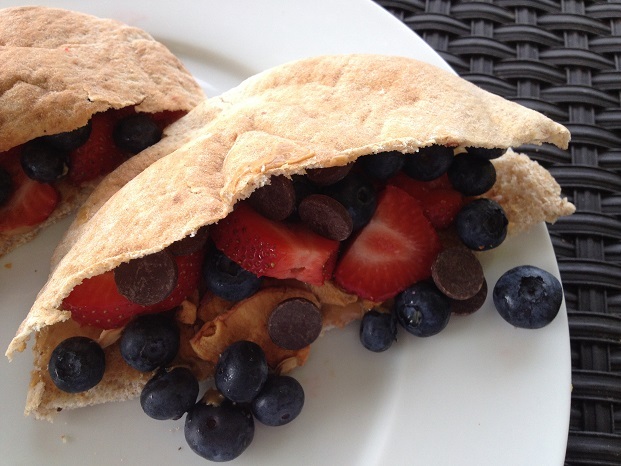 Spread peanut butter inside both pita halves. 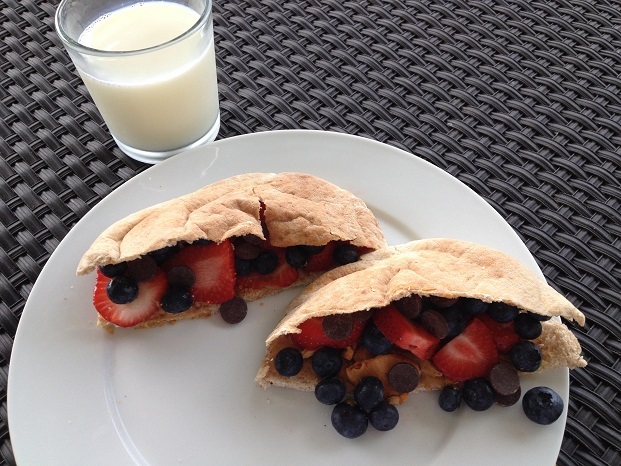 Fill pitas with strawberry slices, blueberries, and dark chocolate chips. If desired, microwave stuffed pitas for 20 seconds and then at 5 second intervals until chocolate is melted. Add apple chips to pita. Enjoy! Nutrition note: Fuel and replenish with carbohydrates (whole wheat pita, fruit, milk), lean protein or protein with good-for-you fats (fat free milk and peanut butter), and a little unsaturated fats (peanut butter). Dark chocolate in moderation adds flavor and a little antioxidant boost.